The bartender at Tostado’s Grill was singing “Purple Rain” when my 5-year-old son head-banged his chin into the table and started bawling. It was unfortunate because the bartender was actually pulling off a pretty decent karaoke rendition of the Prince classic, and my son injured himself in the process of showing his sincere appreciation. His howls were quashed by our quick-thinking waitress, who quickly set before him a heaping bowl of ice cream. This simple act spoke to at least two prominent characteristics of Tostado’s Grill: first, bartender Michael Schleich can carry a tune (and will, if you ask); second, the staff is attentive and kid-friendly. The restaurant itself comes off a bit like a displaced west side bar and grill, with its fried-centric, mainly Mexican menu served in a muted 1970s earth-tone room bedecked with neon beer signs. But that doesn’t do Tostado’s justice. The shrimp-and-steak fajitas we ordered were tender, well spiced, and bountiful, and the pico de gallo was laudably fresh. While not quite as tasty, the enchiladas, served in triplets with your choice of protein, were massive boats served in seas of cheese and beans and might be the biggest per-ounce value on the menu. 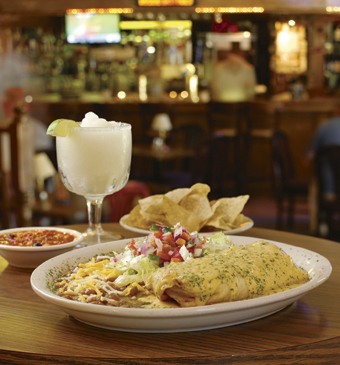 But if you want to live on the wild side, go with the chimichanga. It’s a submarine-sized burrito that survives its final voyage through boiling oil not only intact, but also golden hued and tasting oh-so baad (as in, good), especially after you ladle a mound of melted, spicy cheese over the thing. Sound unhealthy? Ask Michael to make you a homemade margarita and sing you a tune. You’ll forget about your troubles here. Just ask my boy. Originally published in the September 2009 issue.